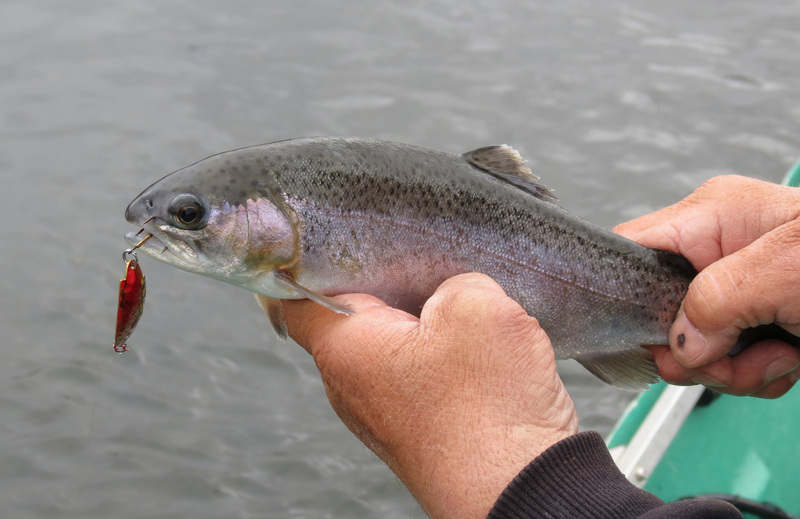 Each October, the Illinois Department of Natural Resources stocks rainbow trout into lakes around the state. While they refer to this program as the catchable trout program, to some the term catchable does not apply. While some anglers will quickly catch their limit, others will fish all day for a fish or two, perhaps none. The highest percentage of fish taken comes on opening day. All too soon anglers catch the most stupid fish. Catching then becomes more challenging. Trout taken early are the more aggressive feeders that have learned to muscle out the other guys. They seem to take just about any bait presented leaving the more shy fish. Trout react to temperature of their surroundings. They move to locations within the lake that are most comfortable for them. It could be a particular depth or a cove where the water temperature is ideal. They prefer a temperature range of 56 to 61 degrees Fahrenheit. When water temperature reaches the 80 degree or higher level, fish die. Trout also prefer water with a pH in the range of 5.8 to 9.5 which is a range between acid and alkaline. Most southern Illinois lakes have a pH of 7.5. Catchable trout are hatchery reared fish. They grow up on a diet of trout pellets. When released into a lake or pond they continue those hatchery feeding habits for a few days. These adaptable little fish soon adopt the wild trout feeding habits and maintain them until caught by an angler. This adaptability means that the angler must also adapt his patterns to continue to catch the fish. Early on the trout will take spinners and marshmallows. Even Velveeta cheese spread placed on a very small hook suspended about 18 inches beneath a small float. After a few days, anglers must switch to live bait. It is at this point that worm dunking becomes popular. Rainbow trout have about 2,500 taste buds. That compares with about 9,000 in humans. Trout are one of least selective feeders. However, they soon turn to only baits that contain tastes commonly found in living tissue. They seek out live baits such as mealworms, red worms, maggots, minnows and nightcrawlers. Pieces of nightcrawler on a number 10 hook are very effective. About one third of a nightcrawler can be skewered onto the hook making the bait last longer. Fresh from the hatchery fish tend to feed within the top foot or two from the surface. Late season fish become bottom huggers. Slip sinker rigs tipped with nightcrawler seem to be most productive. In the late fall weather can also be an indication of fish location. On a windy day, it is advisable to fish with the wind in your face. Most of the catchable trout locations are lakes with relatively featureless bottoms. Structure such as drop offs and points become the only thing to which the fish can relate. On opening morning, these catchable lakes often have anglers standing elbow to elbow. However, if you can wait a day or two, the lake you may find a more normal trout fishing opportunity. For a list of waters open for the taking of catchable trout, contact the Illinois Department of Natural Resources regional office near you or the site superintendent of a park listed in the Illinois Fishing Information booklet published by the IDNR. The booklet is available wherever fishing licenses are available and on line at http://www.il.gov.us.